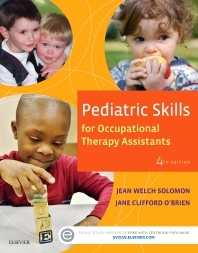 Learn to provide effective therapy for children and adolescents with Pediatric Skills for Occupational Therapy Assistants, 4th Edition. This market-leading text offers a comprehensive, application-focused guide to pediatric occupational therapy assisting by incorporating the AOTA Practice Framework. The text’s focused and easy-to-use approach to pediatrics covers everything from the scope of practice to in-depth coverage of normal development, pediatric health conditions, and treatment planning. This new edition has also been thoroughly updated and expanded to include new content and chapters on community systems, physical agent modalities, the Model of Human Occupation assessments, childhood obesity, documentation, neurodevelopmental treatment, and concepts of elongation. UNIQUE! Video clips on the Evolve companion website show pediatric clients involved in a variety of occupational therapy interventions to demonstrate how concepts apply to actual practice. UNIQUE! Clinical Pearls boxes highlight expert advice and tips from the authors and contributors. Case examples provide snapshots of real-life situations to show how key concepts apply to real-life situations. Evidence-based content incorporates clinical trials and outcome studies to demonstrate the evidentiary basis for OTA practice. Inclusion of cultural diversity and sensitivity issues familiarize readers with the diverse groups of people that OTAs treat in practice. Incorporation of prevention information demonstrates that the OTA’s role goes beyond intervention and treatment. Family-centered perspective uses the terminology of the AOTA Practice Framework to focus on tailoring the OT approach to meet the needs of children within the context of their own environments. Review questions and summaries at the end of each chapter help readers assess and evaluate what they have learned. Suggested activities in each chapter help readers bridge the gap between the classroom and the clinic. Key terms, chapter outlines, and chapter objectives at the beginning of each chapter prepare readers for the information they’re expected to learn from the chapter. User resources on Evolve companion site include a variety of activities to help reinforce the material in the text, including: video clips and review questions.